Michael Montgomery, the band's solo horn player has been selected to play in the 2007 European Youth Brass Band, following in the the footsteps of his big sister and the band's principal cornet player Ruth Montgomery who was selected for the 2006 Band. 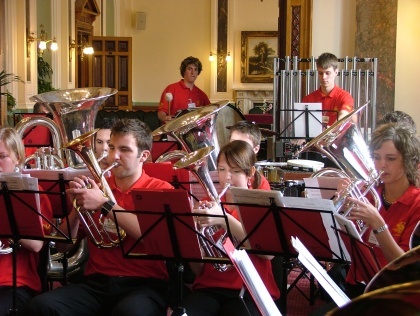 The European Youth Band is to play a major part in the week long festival of brass in Birmingham. The 2007 European Youth Band will have a prestigious presence in this year�s European Championships. The band, conducted by Ian Porthouse, will gather in Birmingham on Saturday, 28th April and will be based at the Norfolk Hotel in the Hagley Road. This is where they will rehearse to prepare music for their various concerts. They get off to a quiet start at Chamberlain Square in Birmingham on Thursday 4th May, when they will give an outdoor concert from about 12.00-1300 hours, underneath the BBC Big Screen, as guests of the Birmingham City Centre Partnership. 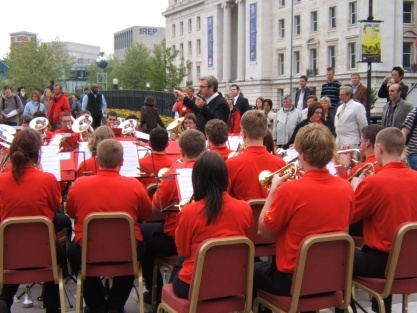 On Friday 4th May the band will perform at the Opening Ceremony of the Championships at the Banqueting Suite of the City Chambers, as guests of the Lord Mayor of Birmingham. Moving on to Saturday 5th May, the EYB will present a short concert in the foyer of Symphony Hall between the 'B' Section and 'A' Section contests. This should be around 11.15am. In the evening the young people, representing 16 European countries, will perform in the second half of the Gala Concert when they will perform a new work from Philip Harper, 'Lionheart'. A guest conducting appearance from a legend of the Europeans, Major Peter Parkes, is sure to be a highlight for these young musicians. Sunday 6th May will see the EYB share a concert with Brass Band Oberösterreich at the Adrian Boult Hall, starting at 11.15 am. This is a wonderful opportunity to hear some brilliant playing from the Austrians with the fantastic Hans Gansch on cornet.